As natives of the Blue Ridge mountain area, we know how enchanting the mountain lifestyle is. We hope you'll enjoy this area as much as we do. 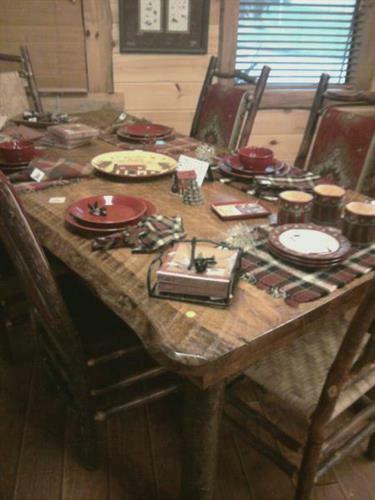 Here at Jerry's Mountain House, we offer everything you'll need to furnish your mountain abode. We specialize in all things mountain lodge from building materials to full turnkey interior design services. 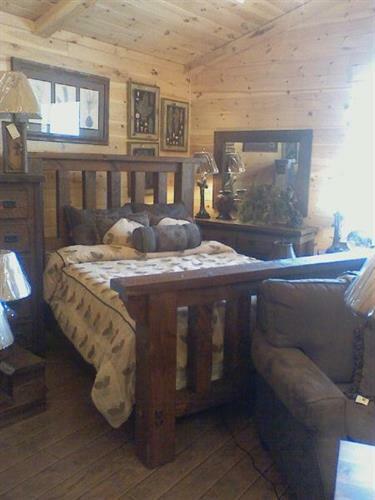 If you are building a new home or adding some all natural wood touches, we have what you need. We offer the most magnificent supply of unique wood building materials. We specialize in unique mantels, stair treads, railings, vanities and counter tops that bring to life that perfect mountain home look you've been yearning for. All of our wood products are kiln-dried on sight at our shop in Blue Ridge, ensuring that our materials are of the highest quality and most durable in the industry. 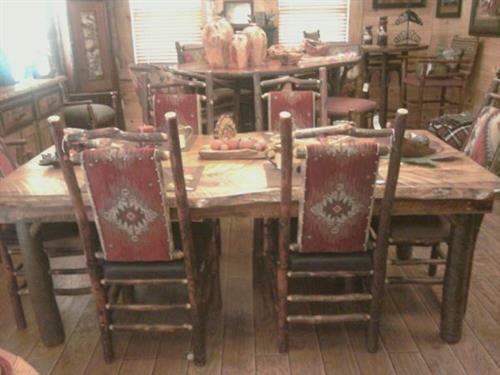 Both of our retail furniture operations are certified dealers for Old Hickory, King Hickory, LaCrosse, Marshfield and Shadow Mountain making certain our company has the latest elegant lodge furnishings available. 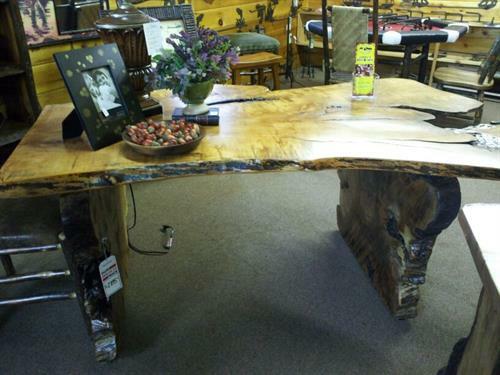 In addition, we carry one-of-a-kind mountain lodge beds, dining room tables, sofa tables, side tables and case goods all designed and created in our shop. The custom-built pieces, allows you to choose the wood, style and size to fit your needs. You will be able to complete your project with the latest accessory touches including bedding, art, lamps, floral arrangements, window treatments and bathroom accessories. 515 North, 2.5 miles past Home Depot on right, in front of Blairsville Cinema and Gallaxy Bowling on the right. Greenish Tan Log Building with front porch.